There is a proverbial saying in medicine that “children are not small adults.” This is especially true in pediatric imaging, given that the “normal” appearance changes in time with the structural and physiologic changes of normal growth. The adult skeleton, for example, is very different from that of the skeletally immature individual, and there are notable differences between the bones of a newborn and those of a toddler. Many radiologists – even experienced professionals – do not feel comfortable with pediatric studies, including those related to the immature musculoskeletal system. The most important cause of this aversion is, by far, lack of familiarity with the normal appearance of the growing skeleton and its developmental peculiarities; this unawareness is a barrier both to recognition of normal patterns and to the diagnosis of pathological findings. 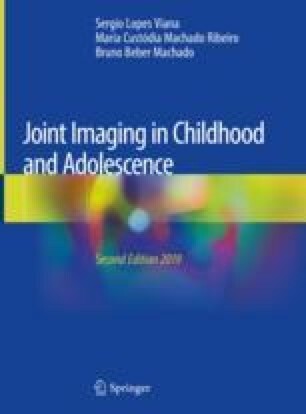 The purpose of this chapter is to provide the reader with a brief review of the anatomical, histological, and physiological bases of osteoarticular development, which are crucial for interpretation and understanding of pediatric musculoskeletal imaging. Beckmann N, Spence S. Unusual presentations of focal periphyseal edema zones: a report of bilateral symmetric presentation and partial physeal closure. Case Rep Radiol. 2015. https://doi.org/10.1155/2015/465018.